A few years ago a colleague asked me to recommend a novel or a writer that would epitomise England. It was a question I found nigh on impossible to answer at the time. The passage of years hasn’t made it any easier. 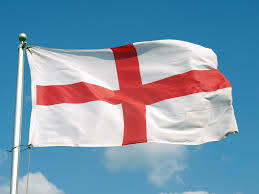 But in honour of St George’s Day today I thought I would revisit the topic. I posed the same question in 2013 when I started my world literature project and started with Reading the Prime Meridian (reading one novel for each of the countries through which the meridian runs). The responses I received, which you can view here. I deliberately asked people to avoid recommendations for Jane Austen, Charles Dickens or George Eliot. Of course they typify a certain side of England — if you want a view of life in rural and provincial England in the mid nineteenth century then who better than Eliot? Or if you want a picture of how urbanisation was changing the nature of the city, then Dickens is certainly your man. All good choices and ones I suspect would be top of mind for many readers. But they give us only one facet of England. And one that is now a few centuries past. What about something more recent? Evelyn Waugh was one suggestion. If we’re talking Brideshead Revisited then yes that would give us a view of the English gentry on the eve of World War 1. The stately home, fox hunting side of England if you like. Other suggestions came from friends: Grahame Greene (Brighton Rock); Iris Murdoch (The Sea, The Sea); Peter Ackroyd (Hawskmoor, The Lambs of London), Ian McEwan . All good suggestions but I don’t see them as typifying England. The more I thought about this and the more suggestions that came in, the more I realised that there was one aspect of England that wasn’t getting reflected at all. And that is the multicultural dimension. Visit London on any day and the number of accents you’ll here is astonishing – and I don’t mean accents of tourists or day visitors. I mean people who live and work in the city. Polish, Australian, Indian, Chinese, French, Arabic, Canadian … and those are just ones that I recognise. This isn’t a phenomena confined to London, you’ll get the same impression in Birmingham or Leeds. Of course I can argue that it was ever the same – that England has long been home for people from outside the island. What we think of as Englishness today has much to do with invaders from the Roman Empire, from France and from the Nordic lands. They gave us straight roads (thank you Romans); influenced our language (more than 60% of the words we use in English today have a French origin) and many of our place names (the Viking name for York was Jorvik, any place name that ends in horpe or thwaite derives from the Vikings). In the twentieth century Italians brought us ice-cream parlours and real coffee (well before the likes of Starbucks) and Pakistan settlers introduced us to biryani and masalas. In a hundred years time, when readers want to understand what the English novel was capable of, and what English life truly felt like, they will look at NW, and warm to it. So there you have it, one novel that could be said to represent England as the country stands today. Posted on April 24, 2015, in Book Reviews and tagged Charles Dickens, George Eliot, UK, Zadie Smith. Bookmark the permalink. 11 Comments. Good choice. I really liked NW. Of course, you can’t really sum up a whole country in one book, but I like the idea of avoiding the stereotypes of village and countryside to look at a Britain more familiar to a large proportion of the population. I’m going to do a similar post to mark July 4 celebration in USA and suspect I will have just as big a challenge. Pat Barker, especially the Regeneration Trilogy, comes to mind. I think she’s an absolutely brilliant writer. I read the first part in the trilogy but haven’t got to others yet. One day I will …. When I think of Zadie Smith’s White Teeth (I haven’t yet read NW), I also think of Rose Tremain’s The Road Home, which bought a part of London to my understanding which I hadn’t known existed. I don’t read enough contemporary English lit to contribute meaningfully to the possibilities, but I agree it’s an interesting and important discussion to have and it’s too bad there aren’t more diverse options suggested when such questions are posed. I don’t know that Tremain one but just looked it up and see that it’s about London from the point of view of an outsider which has me interested. Thanks for pointing it out to me. Zadie Smith is exactly who i was thinking of. Of course then you get the whole question of regionalism. Painting a great picture of London, doesn’t necessarily fit the whole country. Sigh. Questions like this one are always tough. Oh yes, regionalism puts a completely different perspective on the question. It would be interesting to pose the question for example to people living in say, Cornwall and Yorkshire to see if they came with vastly different answers.